The 14th January marks two saints who have long been venerated in the Order. The 14th January is now marked as the memorial of St. Godfrey, but in the traditional Premonstratensian Breviary and missal it was marked as the feast of St. Gerlac. 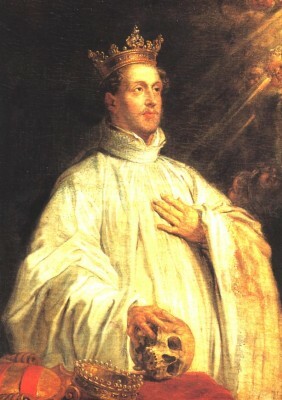 St. Godfrey was born into the wealth and prestige of the counts of Cappenberg. In his early adulthood he played an active role in supporting the cause of the Roman Pontiff against Emperor Henry IV. In 1121 he encountered St. Norbert at Cologne and was so struck by his lifestyle and preaching that he immediately made plans to give away all his possessions and enter the infant Norbertine Order. Together with his brother Otto and his wife Judith, he handed over Cappenberg Castle to St. Norbert on May 31, 1122, thus establishing the first foundation of the Order in Germany. Both Otto and Judith followed Godfrey’s example and embraced the religious life of the new Order. The further donation of his estates at Varlar and Ilbenstadt to St. Norbert caused an uproar among the local nobility who viewed it as a threat to their established aristocracy. Under the leadership of Godfrey’s hostile father-in-law, Frederick of Arnsberg, an unsuccessful military assault was made upon the new monastery at Cappenberg. Through all of these trials Godfrey remained steadfast in his desire to be a Norbertine. When things calmed down, Godfrey received the habit from the hand of St. Norbert. He especially loved to care for the poor and sick in the hospital attached to the abbey. St. Norbert wanted to have him by his side at Magdeburg, but Godfrey felt out of place in the noisy northern metropolis and was granted permission to return to Cappenberg. It was on his way back to Mt. Cappenberg that Godfrey fell sick at Ilbenstadt. Surrounded by his brethren and his brother Otto, he made peace with them all: “My brothers, through love for the Order, through zeal for the glory of God, I have occasionally reprimanded some of you a bit too harshly. I beg pardon from you now.” Moments later, seeing a vision of angels, Godfrey exclaimed, “How beautiful! How beautiful! The messengers of my Creator and God have finally come!” With that he fell asleep in the Lord. It was January 13, 1127. St Gerlac, who died in 1170, had led the life of wild and licentious soldier – including a spell as a highwayman. After the death of his wife he experienced a deep interior conversion. Giving up his former ways and as penance for his past sins he went on pilgrimage to Rome and Jerusalem. He also adopted a rule of life quite different from his former ways. Gerlac was in Rome in 1151 when Pope Eugenius provided him with the penance of seven years in service at Jerusalem. At Jerusalem he worked in the pilgrim hospitals and helping the poor and sick of that city. When he returned to Rome Pope Adrian IV asked him to consider entering some of the existing religious orders, but Gerlac found them incompatible with his vocation. The Pope (who had been educated by Premonstratensians) therefore asked Gerlac to return to his native Holland and live out his vocation as a hermit, in a habit of a Premonstratensians. Gerlac therefore took to living in seclusion from the world and devoting his time to God, attending daily Mass in Maastricht each day. St. Gerlac also received a vision of St. Hildegard. For his dwelling he had hollowed out an oak tree in which to live, but when fame of his holiness and miracles invoked the jealousy of local canons it was cut down by the local bishop. However the bishop soon realised he had been tricked and being convinced to Gerlac’s holiness placed him under his own protection, as well as the guidance of the abbot of Rolduc. Gerlac’s later years were marked by spiritual trials as well as his growing fame as a worker of miracles. As he lay dying the local clergy were unable, or refused, to bring him the Last Sacraments, however a figure, believed to be St. Servatius, appeared and the saint died fortified with all the rites of the Church. In 1172 a Premonstratensian abbey was built at Houtherm where St. Gerlac had died and became a great centre of pilgrimage. Though the monastery was dissolved the parish church remains a centre of pilgrimage. This entry was posted in Norbertine History, O.Praem Saints and Beati. Bookmark the permalink.